Shall I simply say- all protocols observed! Good morning to you all and may I welcome you to this historic and momentous occasion in the estate agency sector. On behalf of the Zambia Institute of Estate Agents (ZIEA), may I say that we are so delighted that you could be present to witness perhaps the most significant milestone that ZIEA (In conjunction with the ZP and the NPA) is laying today. This is a special day, a day that is likely to invoke extreme compliance to the law of estate agency and to disciplined professional practice. In ZIEA, we have waited long for this occasion and are extremely grateful to God who has made all this possible. Allow me to start by expressing our profound thanks both to the Zambia Police (ZP) and to the National Prosecution Authority (NPA). Although I do not mention specific names, this day would not have been possible without the unflinching support of these two institutions. They bore with us as we had meeting after meeting, consultation after consultation- all this culminating in what we now all witness this morning, the signing of the MOU among the three institutions. The journey has been long, winding and demanding. But finally, the fruit of this is now before us. And through this MOU may be triggered unprecedented events in the estate agency industry. Allow me too to thank the ZIEA Council for the persistence and consistency in pursuing this MOU to this very day. The work that you have accomplished will stand out for all to see. The ZIEA was established by an Act of Parliament, the Estate Agents Act No. 21 of 2000, with the express purpose of registering and regulating estate agency. The estate agency industry has tremendous potential to be a power-house of the economy in terms of income generation which also translates into significant tax payments to ZRA (mostly Property Transfer tax, WHT and other income tax), potential to generate a significant number of direct and indirect jobs (in line with the intention of the Government) and of course the provision of the much needed intermediary function between the players in infrastructure development, another key objective of the government. When all these benefits of the industry are obtaining, what you get is an efficient property market, happy citizens whose transactions are executed speedily, efficiently, safely and within the framework of the law resulting in the attainment of their wealth objectives. The whole country benefits. So you can see that a well established and regulated estate agency industry has immense value to the country. Unfortunately, this value has remained significantly constrained and unrealised. Part of the problem is the presence of unregistered, unregulated estate agents, who we call bogus agents. This group of people introduce inefficiency, illegality and crime in the industry. They do not pay tax. They often do not employ people properly and they are generally not accountable to anybody. They operate using the law of the jungle. They have no problem cheating, stealing, deceiving and doing anything as long as they get a fee. Innocent citizens who have fallen prey to these agents have lost money, property, opportunities and peace of mind. Individuals loose. The country looses. Bogus agents are a real menace. The ZIEA council has a mandate to implement the provisions of the Estate Agents Act No. 21 of 2000. Part of the mandate includes dealing with these illegal agents and protecting members of the public. ZIEA also has a duty to ensure that registered estate agents are operating according and within the confines of the law and that they are protected from the scavenging activities of these bogus agents. This is why we cannot ignore the problem of illegal agents. We must face it and deal with it. We must get rid of them. However, like many other things in life, it is difficult to deal with these agents on our own. Part of the solution requires the specialised skills and position of certain other institutions. This is why ZIEA engaged the ZP and the NPA. This was borne out of recognition that we cannot completely enforce this Act without the crucial support and input of these two institutions. While ZIEA might have information about who is operating illegally in the industry, we need the police to undertake investigations, necessary arrests and charge criminals in the industry. We also desperately need the NPA to facilitate and ensure the speedy and correct prosecution of these individuals who chose to blatantly ignore the law and undertake illegal activities. 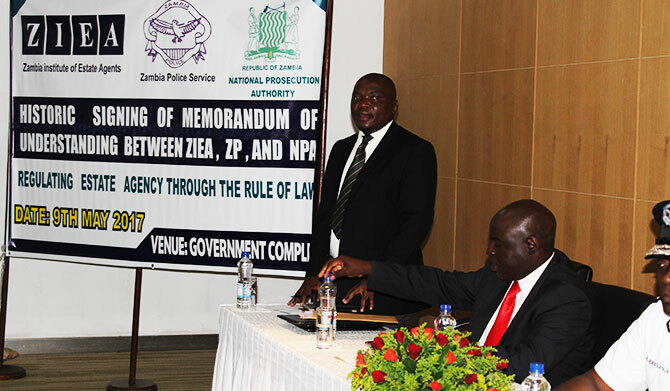 Thankfully, across the last 1 year or so, both ZP and the NPA have been more than willing to work with ZIEA and develop a framework of operation that will assist us implement the provisions of this Act especially as they relate to wrong doers. The result of this engagement among our three institutions is the MOU that we witness this morning. The signing of this MOU is a critical signal of the ushering in of a new era in estate agency according to the rule of law. Today we erect a signal that should alarm anybody who is practicing estate agency illegally, a signal that the days of illegal practice are gone. Now is the time for immediate compliance. The law enforcement agencies have taken a stand that will make all those doing wrong in this regard come into conflict with the law. This is also a signal to all those practicing estate agency lawfully complying with the law and ethically that the days of suffering through unfair competition with bogus agents who are practicing estate agency and reaping illegal rewards because they do not pay any taxes are also gone. This MOU is a final signal to every person who wants to practice estate agency legally to dash to the ZIEA and register and join the family of credible, ethical and law-abiding estate agents. Our people stand to benefit from this MOU. Our government stands to benefit through lawful practice and tax compliance through this MOU. Once again, may I thank the ZP and the NPA for making this opportunity a reality. We are very excited at ZIEA and very optimistic that what we have undertaken here today, will result in a very fruitful relationship with immense benefits for our people, our government and the country at large.